Swetha Bobba, a PhD student in the Department of Electrical & Electronic Engineering, was one of 15 finalists in the recent 2015 UK ICT Pioneers competition, led by the Engineering and Physical Sciences Research Council (EPSRC). 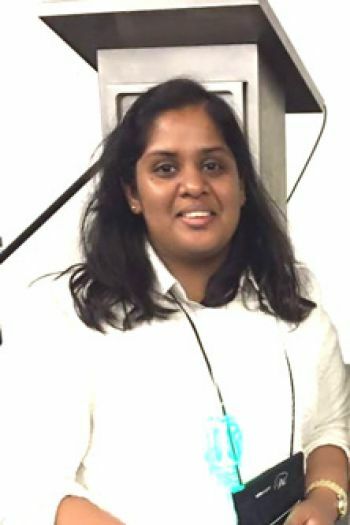 PhD student, Swetha Bobba who is supervised by Dr Arti Agrawal in the Department of Electrical & Electronic Engineering, was one of 15 finalists in the 2015 UK ICT Pioneers competition led by the Engineering and Physical Sciences Research Council (EPSRC). Swetha’s competition entry was titled ‘Supercontinuum generation in Graphene fibers’. The awards ceremony took place on 29th October at the Queen Elizabeth II Conference Center in London. The UK ICT Pioneers is a unique partnership between the EPSRC and key stakeholders. It aims to recognize the most exceptional UK doctoral students in ICT-related topics who are able to communicate and demonstrate the excellence and, exploitation potential of their research. Swetha received her Bachelors of Technology in Electronics and Communications from Jawaharlal Nehru Technological University, Hyderabad in 2012. She was also a Research intern at Massachusetts Institute of Technology-Harvard. “I am very pleased at having been selected as a finalist in such a very important national competition here in the UK. It was a very rewarding experience to have participated and received such huge appreciation for my work”. Graphene is a highly conductive allotrope of carbon whose atoms are arranged in a mesh-like form a single atom thick. The substance was discovered to be present in ordinary graphite in 2003. Graphene has greater electron mobility and more efficient heat dissipation than silicon. Because of these and other attributes, graphene may one day replace silicon as the semiconductor material in microchips and enable the continuation of Moore’s Law. A research team led by Professor Andre Geim of the Manchester Centre for Mesoscience and Nanotechnology built a graphene transistor and described it in the March 2007 issue of Nature magazine.